ABS’ findings pertained to the jacking system from the pinion back to the motor and included observations of cracks, wear, deformation, noise, chips out of teeth, bearings out of tolerance and damaged bearing housings. Data Courtesy of ABS. Concerns have been raised in the offshore industry about wear on jacking gears that could have serious safety consequences to operations. 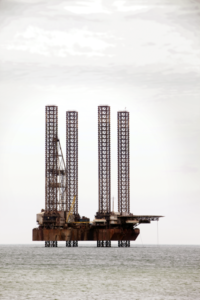 Without a doubt, aging assets, particularly in the global jackup fleet, continue to present safety concerns for owners. At the end of 2016, 260 of the jackup rigs in the fleet – nearly 50% – were more than 30 years old, according to Rigzone. With the current state of the industry, owners are reining in spending and are working to get the most out of their existing assets. For the jackup fleet, in many cases, that means maintaining mature rigs that will need to work past 35 years of age and contend with component wear that could increasingly impact overall functionality and safety. One of the goals of every asset owner is to make sure that aging units function safely. Inspections and maintenance are critical to preserving asset integrity and safeguarding crews. By taking a proactive approach, it is possible to significantly reduce operational and safety risks. But making prudent decisions about maintenance requires an understanding of the integrity of the aging assets, and that should be based on data. Aging assets, particularly in the global jackup fleet, continue to present safety concerns for owners. 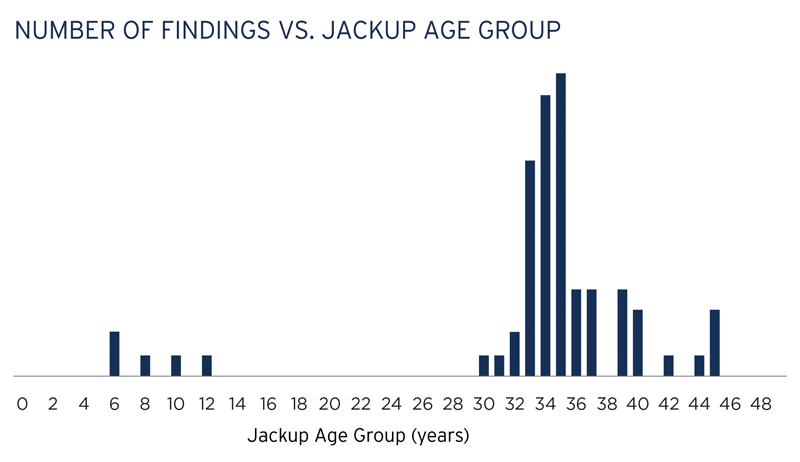 According to Rigzone, nearly 50% of the jackup rigs in the fleet were more than 30 years old at the end of 2016. One of the values of annual classification surveys is that they allow an independent evaluation of the jackup’s continued compliance with class rules and standards, in some cases giving surveyors visual evidence that the structure and equipment continue to meet the prescribed standards or, conversely, to identify components that need repair or replacement. The survey requirement for classed assets helps owners plan for repair and replacement that otherwise could delay or compromise operations. Recent gear failures have led to concerns in the industry about wear on jacking systems and how that is affecting safety. To determine how serious this issue is to jackup safety, it is important to look at operational data to determine the true levels of wear and at what point in an asset’s life wear becomes a serious concern. Field data from active units provide performance information that identifies issues from active assets. 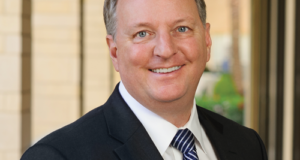 This allows the industry to avoid making anecdotal assumptions that could misdirect safety efforts and to instead focus attention on real threats to asset integrity. Through joint industry projects, ABS has been gathering condition data from ABS-classed jackups around the world with a focus on jacking system components. 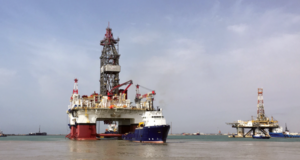 The data gathered from working units in the field provide a factual indication of jacking gear integrity that allows a clearer picture of asset health to emerge. The data collected from the global fleet of ABS-classed jackups includes findings such as cracks, wear, deformation, noise, chips out of teeth, bearings out of tolerance and damaged bearing housings. Findings include a number of observations that pertain solely to the jacking system from the pinion back to the motor, meaning that the foundation, the rack and the other components of the jacking system were excluded. The vast majority were found in rigs 30 years old or older. The fleet from which the data were collected includes a large percentage of jackups that are more than 30 years old. The range in age of the evaluated assets is important because age was a significant factor in the findings. For ABS-classed jackups aged 20 to 25 years, there were few issues with component wear. 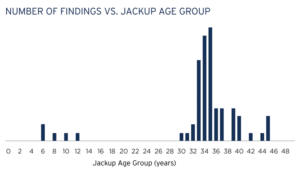 Not surprisingly, perhaps, most of the findings that appeared in the survey data were identified in rigs 30 years or older. In fact, the greatest need for jacking gear replacement occurred in jackups that ranged in age from 30 to 45 years, with those 36 years of age recording the most gear replacements. In all, 100 replacements were identified. It can be concluded based on data collected from active jackups that jacking gear lifespans and functionality are in line with design expectations. By gathering actual performance data, it is possible to identify the stage at which wear becomes a concern for an individual unit. Classification societies and owners use annual surveys to identify weaknesses in the years before failures are likely to appear; therefore, it is possible to plan maintenance and repairs that keep the units working safely. 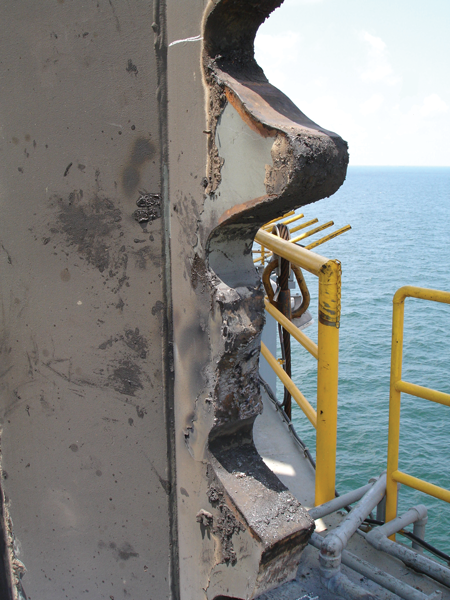 Worn and damaged jacking gear components can compromise jackup safety. Photo Courtesy of ABS. With an aging jackup fleet, safety becomes even more important, which makes the rules and guides classification societies develop more critical because they assist in determining safety requirements. The goal of the guides and rules is to improve the safeguarding of people, assets and the environment by providing a structured way to verify that safety criteria are met. ABS rules and guides are developed in part based on the results of data gathered from field operations and in part from research and development (R&D) initiatives that target specific safety issues. 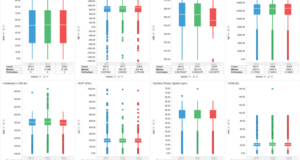 Results from R&D provide data that engineering teams use to develop and enhance the guidance documents owners and operators follow to maintain the safety of their assets. As safety concerns evolve, there has to be a clear understanding of emerging challenges and how they affect working assets. The key to safety in jackup operations is constant risk management, and part of the management program is improved verification processes. One of the recent pieces of guidance produced for jackup safety is the ABS Guide for Survey and Inspection of Jacking Systems, published at the end of 2016. Click here to access the ABS Guide for Survey and Inspection of Jacking Systems.